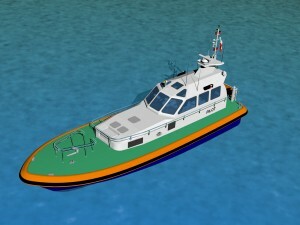 Holyhead Marine Services Ltd has won a prestigious contract to build two pilot boats for Harwich Haven Authority. The yard has invested in new mould tools for the new 16m Camarc design which will feature Scania Di16 engines powering twin screws. The mould tool however is constructed in sections and could be adapted to mould a longer 18m version with either propellors or waterjets. The contract is an important one for Holyhead Marine Services marking its entry into the Pilot boat market as well as being a suitable design for use as a military patrol boat.